For over 45 years, we have manufactured measuring and control devices for energy saving, air pollution control and groundwater protection. As a result of constant work with legal regulations and their implementation in these areas, our environmental awareness has developed very early. As a family business, we do not manufacture here today and there tomorrow. We are connected to certain places, to the country and to the people. Environmentally friendly production takes centre stage at AFRISO. We assume responsibility for the employees, the company, the neighbours and the surrounding places. The AFRISO environmental protection officer has a high priority. This position is taken by a managing director. In each decision, we consider the environmental impact. This begins with the product idea and accompanies the entire development and production process all the way to the end of the product life cycle. Our company does not operate any production facilities that fall under the Federal Immission Control Act. The heating systems are up to state of the art. Air and noise emissions are low. The business property in Güglingen is over 3 hectares in size. 35 % of this area are covered by buildings, 30 % are traffic areas and parking lots and 35 % are green space. In 1988, our company received a special award from the district of Heilbronn for the "Design and Greening of Commercial and Industrial Areas", and in 1999 the Environmental Award of the Association of Independent Businesses (ASU). We have been a member of ISD Interseroh GmbH since 1994, one of the leading environmental service companies for recycling processes. As early as 1998, we registered our company as per European Eco Management and Audit Scheme (EMAS) and had it certified according to ISO 14001. 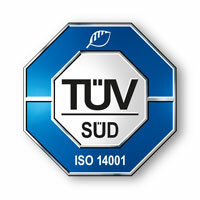 Since the ISO certification has a greater significance on an international scale, today we only have the ISO certification. And our employees are also highly motivated: Since 1998, they have made 228 improvement suggestions for environmental protection, 212 of which were implemented. External environmental protection auditors have attested to our more than average commitment in the area of environmental protection for many years. Since 2002, we have invested more than 1.8 million Euros in environmental protection. The measures are varied; they cover the areas of heat recovery, optimum heating of offices, renewal of windows, compressed air pipes, effective flood protection. Where statics permit, the roof areas of the production halls are covered with plants or harvest solar energy, which allows up to 350,000 kWh of electricity from renewable energy to be fed into the public grid each year.